Known in the Rugby League world as ‘The King’, Wally Lewis is viewed by many as the greatest to ever play the game. During the 1980s and 90s he was the dominant force in Australian rugby league and one of the most celebrated and recognizable sportsmen in Australia. Lewis led a Queensland revival in State of Origin and played in 33 Tests for Australia…. Known in the Rugby League world as ‘The King’, Wally Lewis is viewed by many as the greatest to ever play the game. During the 1980s and 90s he was the dominant force in Australian rugby league and one of the most celebrated and recognizable sportsmen in Australia. Lewis led a Queensland revival in State of Origin and played in 33 Tests for Australia. He spent much of his career as captain of both Queensland and Australia. Lewis was born to play State of Origin. Over 11 seasons, Lewis missed just two Queensland State of Origin games and won eight man of the match awards. In club rugby, Lewis played in a premiership with Wynnum-Manly in the Brisbane competition. The birth of the Brisbane Broncos in New South Wales Rugby League is often attributed to the success of the Lewis-led Queensland State of Origin team. In the twilight of his career, Lewis parted ways with the Broncos and spent two years with Gold Coast. Able to control the tempo and direction of a game, Lewis inspired his team mates and frustrated opposition fans with ferocious tackling and an incredible passing game that revolutionized the sport. 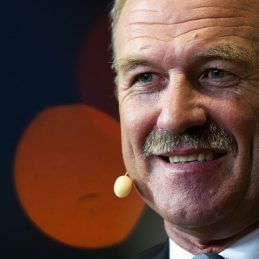 Following his retirement, Lewis made a seamless transition into the media; with stints as a news and sports anchor on Channel Nine in Queensland and as a commentator and panel member on Fox Sports programming. Lewis publicized his post-retirement struggles with seizures and depression in his 2009 biography; Out of the Shadows. His no-holds barred account told of the dark days to his return to television. Lewis is a highly popular motivational speaker who captivates and inspires audiences. His presentations cover topics of leadership and hard work and are personable, professional, and humorous.